Disclosure: I received a gift card to help facilitate this post. As always, this post contains my honest opinions. Being just a second generation Italian, I know the importance of food when getting together with friends. Food is more than just the sustenance of life when sharing with friends. It becomes a gesture of love. I am so blessed to have so many great friends in my life--ones I can really trust. I have moved around a good bit in my adult life, and where I am now is actually the longest I have lived anywhere since I left home at age 18. Most recently, my path seemed to cross with on woman for many years before we actually became great friends. I'd see her occasionally at the library for story time or bump into her at the grocery store. I'd see her at the Y working out. 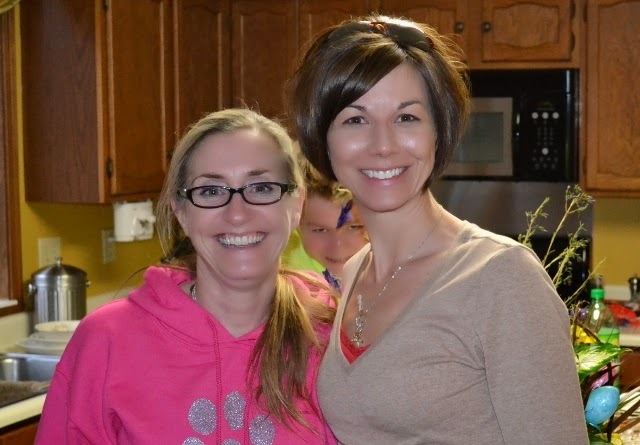 She was always so friendly to me, but I was a busy mom with little ones, as was she. It wasn't till I stopped home schooling and my kids started to school that I would see her at the Y on a regular basis and we began to talk about things other than story time and diapers. I could immediately tell she was trustworthy. 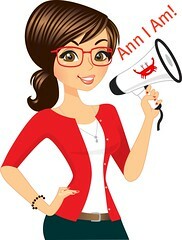 We began chatting on Facebook instant message in the evening and grew closer and closer. She is someone that gets me and we both share similar beliefs in regards to motherhood, families, faith and friends. When I had the opportunity to create a recipe for Ragu, I knew her and her family would be perfect to share it with. After all, if my recipe was a flop, I was confident she would still love me! However, I was pretty certain that if I used Ragú® Old World Style® Traditional Sauce in the recipe, it was bound to be good. Especially since each jar of sauce is made with 11 juicy tomatoes, making this sauce the richest, thickest recipe yet. 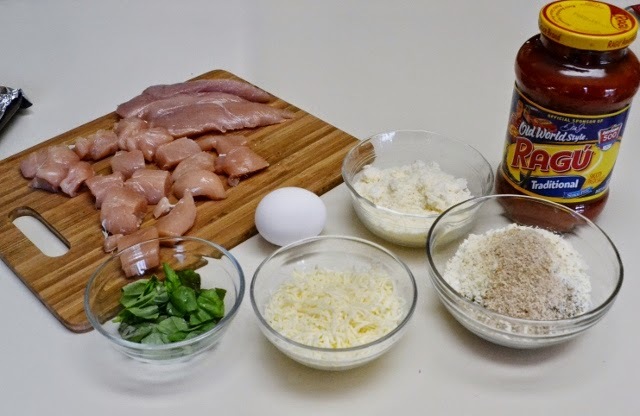 I decided to take a twist on an old recipe--Chicken Parmesan and change it into an appetizer. 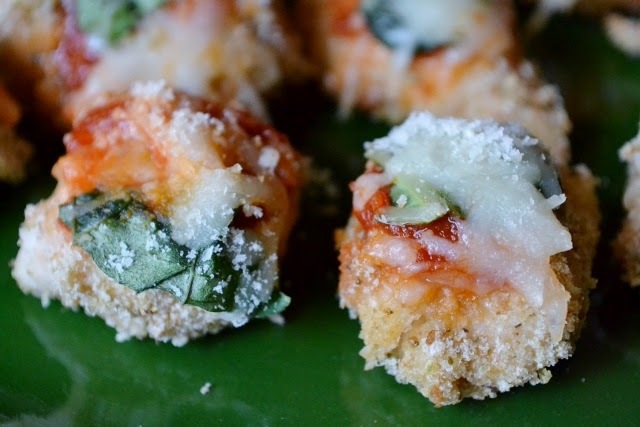 Chicken Parmesan Poppers is what my family named them, since they are easy to just pop into your mouth. They are so delicious--everyone loved them! Preheat oven to 375°. Line two baking sheets with foil and grease with cooking spray. 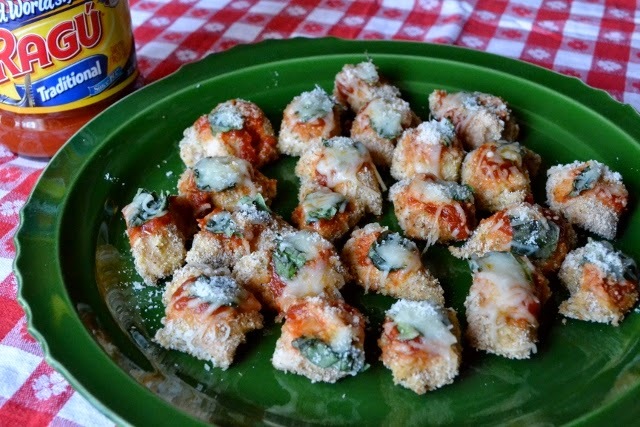 Combine bread crumbs, Parmesan cheese, Italian seasonings, and garlic salt in a shallow dish. Beat egg in a bowl. 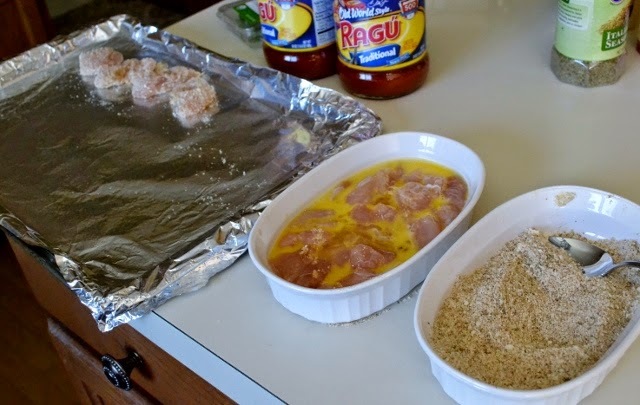 Dip chicken in egg, then the crumb mixture, turning to coat. Arrange on baking sheet and bake 6 minutes. Spoon a bit of sauce on top of each piece, then add a piece of basil and sprinkle with the Italian cheese blend and grated Parmesan cheese. Bake 3-4 more minutes or until chicken is thoroughly cooked. (Thickness of chicken pieces will determine how long to bake.) Serve hot. If desired, add on top of a plate of spaghetti with Ragú Old World Style Traditional Sauce for a main entree. The assembly line: Dip chicken in egg, then bread crumb mixture. I even got the hubs involved! After baking 6 minutes, top with Ragú® Old World Style® Traditional Sauce and a basil leaf. Finished product. Let me tell you--it has been very hard to get a photo of this because they disappear so quickly! Let me tell you, it is so hard to get a photo of the final product. I had to make them twice and at that, I had to swat my husband's hand the second time around so I could get a shot off. This is an awesome recipe! I would suggest putting them straight on a warming tray as they do tend to cool off quickly if not. Being cool didn't stop my family and friends from eating them, though. 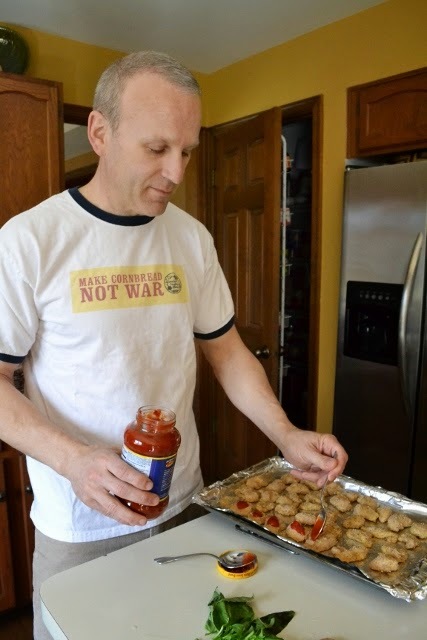 If you want more easy, delicious authentic Italian recipes, be sure to visit www.Facebook.com/RaguSauce. You may want to enter the Ragú Better and Better Sweepstakes for a chance to win great Authentic Italian themed prizes, including a grand prize trip to Italy for a family of four at www.RaguSweeps.com! I know I would LOVE to go back to Italy! These look delicious! Being gluten free, I wonder if I can substitute cornstarch for the bread crumbs and make it work. I will have to run it by my personal chef (my husband!). Yum! Looks delish! Cant wait to try some. Yum! I will have to try these! Love the photos!